Make event preparing easy by collecting necessary information about each guest up front so you can focus on the guest experience. Preparing for a fundraising event is no joke. It's HARD work, which is why Network for Good has been working on making it a little bit easier on you and your team. We want you to spend less time worrying about chasing down important guest details leading up to the event so that you can focus on more important things, like making your guests feel inspired to give while they are at your event. Network for Good now gives you the ability to collect necessary details for each guest when tickets are purchased online or even offline. Need to collect contact information and personal preferences for your upcoming gala? Need to collect names for each person in the foursome for your golf tournament? We have you covered! Read on to find out how easy it is to collect and organize this information using events questions. When adding a new event ticket you will see an option that makes it super easy to collect contact information for each guest. For instance, if you are selling tickets for tables, golf foursomes or whatever it may be this new feature allows you to collect contact details for each guest with one simple click. You can then edit the questions and make them required if you wish. Whether adding a new or an existing ticket, you can add questions for the ticket purchaser to complete during checkout. Just go to your Tickets tab on your event and click "Edit Questions" next to the appropriate ticket. You will be taken to your question builder where you can add questions to your ticket or modify existing questions. 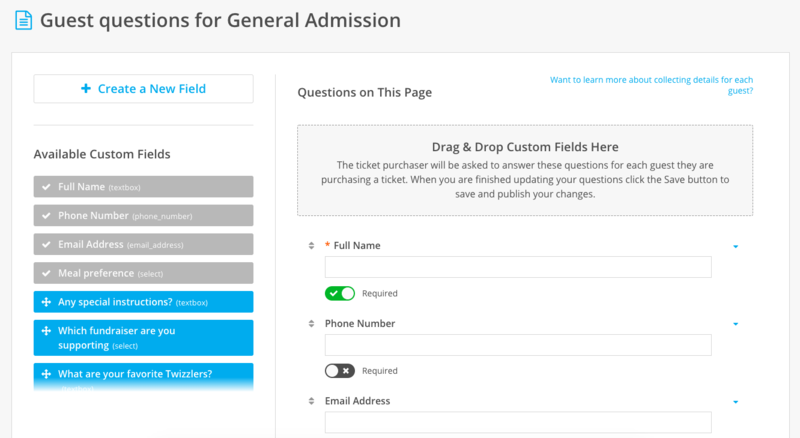 You can also make these questions required, which means the ticket purchaser cannot complete the checkout process without providing these details for each guest. Click "Save" at the bottom of the page to publish your changes. For those people that mail in their registration or give it to you in person you can easily record their ticket purchase along with details for each of their guests. Just go to the Guests tab on the event and click "Add Ticket Purchase." After you record their ticket purchase you can then go to the Guests tab, locate the ticket purchaser and click "Edit Guest Info" to record details for each guest. It is inevitable that guest names and preferences will change as the event date approaches. We make it easy to keep this information up-to-date so that you always have the most accurate information for your guests at your fingertips. If you need to make changes for a guest just go to the Guests tab on the event, locate the ticket purchaser and click "Edit Guest Info" and make the necessary updates. You can download the list of guests along with all of their information at any time before, during or after the event by going to the Guests tab on the event and clicking the "Export" button in the top right. Use this to help you prepare for the event, check guests in as they arrive or import guests into your Donor Management System. Your event may be over but there is still work to do, such as thanking the guests who attended and begin stewarding the guests who are new to your organization. Network for Good will help you get these guests added to your Donor Management System so that you can begin these important tasks. Click the "Add Contacts to DMS" button on the Guests tab to get started.